What would the world be like if 80 percent of the population manifested superpowers called Quirks? Heroes and villains would be battling it out everywhere! Being a hero would mean learning to use your power, but where would you go to study? The Hero Academy of course! But what would you do if you were one of the 20 percent who were born Quirkless? A sinister group of vill What would the world be like if 80 percent of the population manifested superpowers called Quirks? Heroes and villains would be battling it out everywhere! Being a hero would mean learning to use your power, but where would you go to study? The Hero Academy of course! But what would you do if you were one of the 20 percent who were born Quirkless? A sinister group of villains has attacked the first-year U.A. students, but their real target is All Might. Its all that Midoriya and his classmates can do to hold them off until reinforcements arrive. All Might joins the battle to protect the kids, but as his power runs out he may be forced into an extremely dangerous bluff! A sinister group of villains has attacked the first-year U.A. students, but their real target is All Might. It's all that Midoriya and his classmates can do to hold them off until reinforcements arrive. 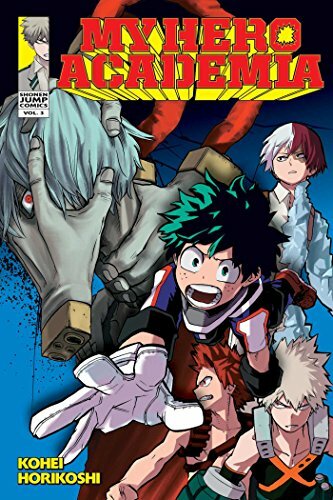 All Might joins the battle to protect the kids, but as his power runs out he may be forced into an extremely dangerous bluff!